I’ve been to Spain a few times, but never eaten Paella there. That’s to explain I don’t know if this recipe is authentic or not, but I surely do like it. It’s based upon one found at All Recipes. I’ve eaten Paella before here in the US, but never really had a taste for it. Something about canned peas and chicken just doesn’t look very appetizing. I think Paella may have been seen as a dish that could easily be stretched for cost savings and became something most Spaniards would never recognize. This recipe turned my thinking on its head. It’s really, really good. Now I make this all the time. Sometimes, I split the recipe in half because this one will feed 6-8 people. 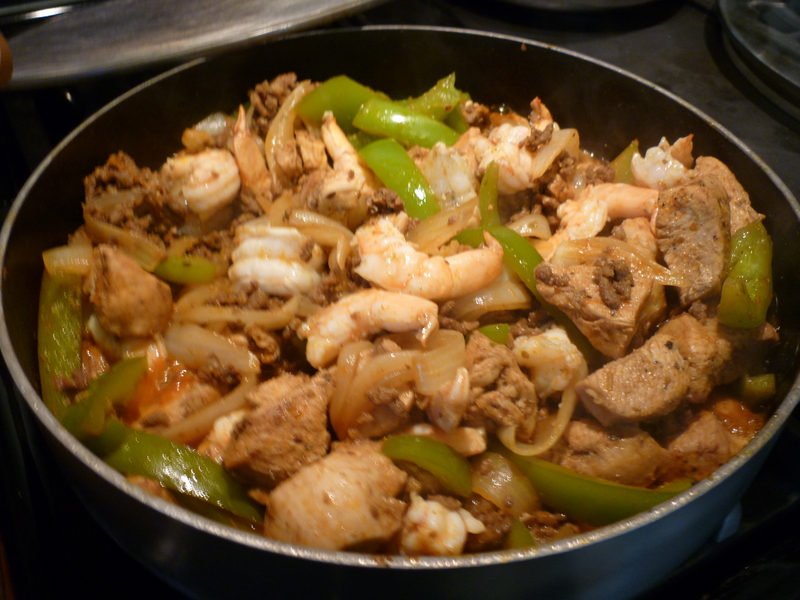 In what you see pictured here today, I only used 1# chicken, yellow onion, and green bell pepper. I used jumbo prawns and cut them in half before adding to the skillet. The saffron threads . . . well, I use this yellow powder that I bought on Grenada in the Caribbean and it says “saffron powder.” I suspect that it is not the hugely expensive saffron, but don’t have a clue what it really is and I don’t care that much. It makes a lovely yellow color and I’m still alive so far. The original recipe calls for 1 tsp. 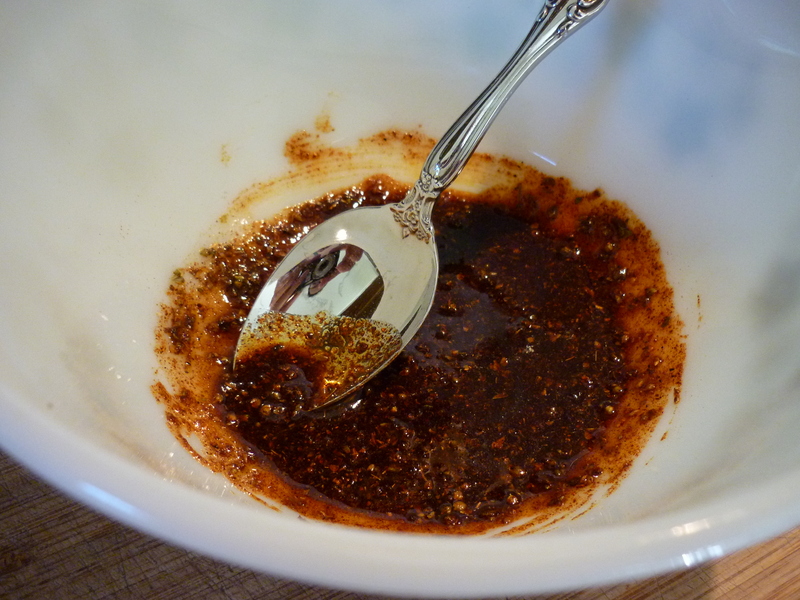 of crushed red pepper flakes, but I’ve reduced it to 1/2 tsp. One was too spicy for some in my household. Mix together: 2 Tbsp olive oil; 1Tbsp. paprika; 2 tsp. dried oregano; and Salt and pepper. Stir in 2# boneless, skinless chicken, cut into 2” pieces. Place into refrigerator. Heat 2 Tbsp. olive oil in large skillet. 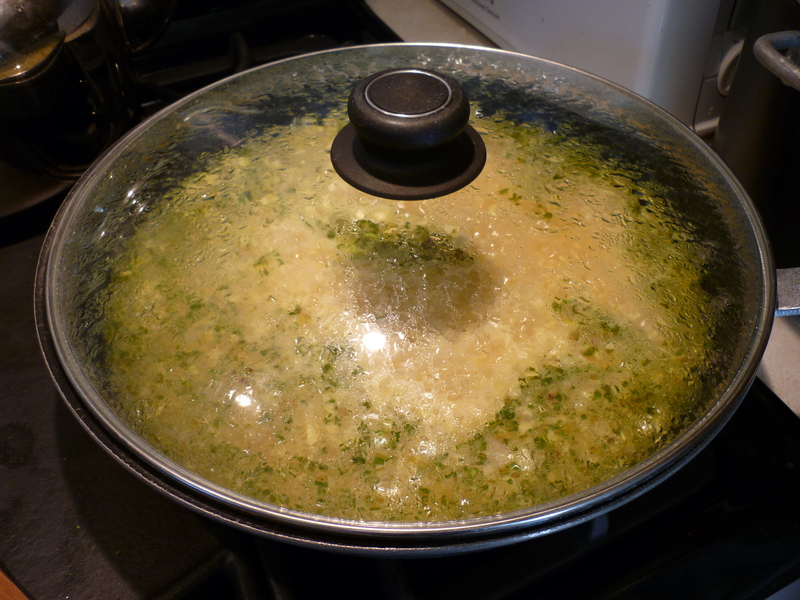 Stir in 3 cloves garlic, crushed; ½ tsp. 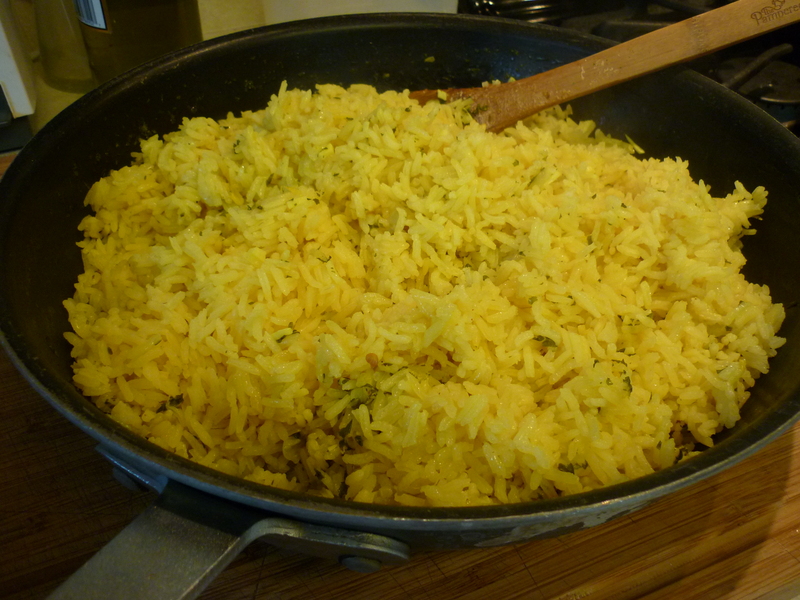 dried red pepper flakes; and 2 cups short-grain white rice (I always use Jasmine rice). Cook, stirring, to coat rice with oil, about 3 minutes. Bring to a boil, cover, and reduce heat to medium low. Simmer 20 minutes. Meanwhile, heat 2 tablespoons olive oil in a separate large skillet over medium heat. 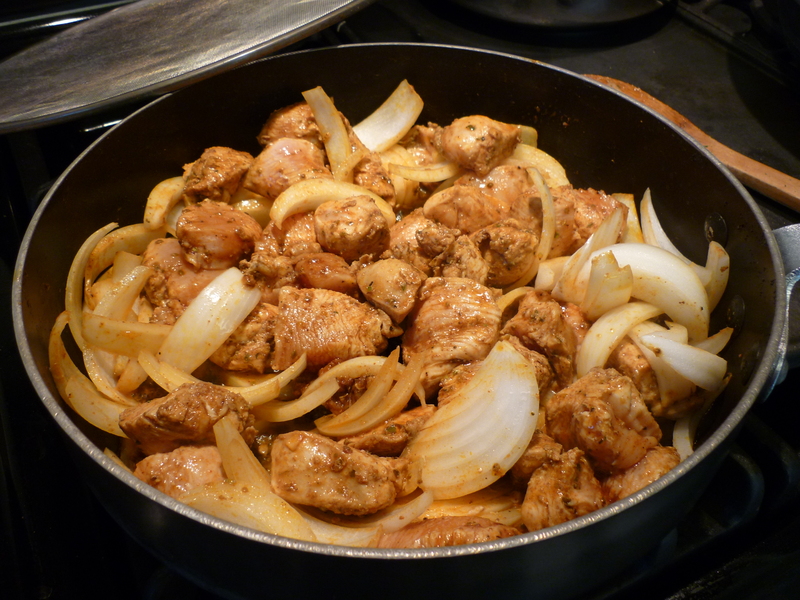 Stir in marinated chicken and 1 Spanish onion; cook 5 minutes. 1# Chorizo sausage; cook 5 minutes. Stir in 1# shrimp, peeled and deveined and cook, turning the shrimp, until both sides are pink. The rice has finished cooking. Now pour the meat and fish over the top of the rice. Enjoy! 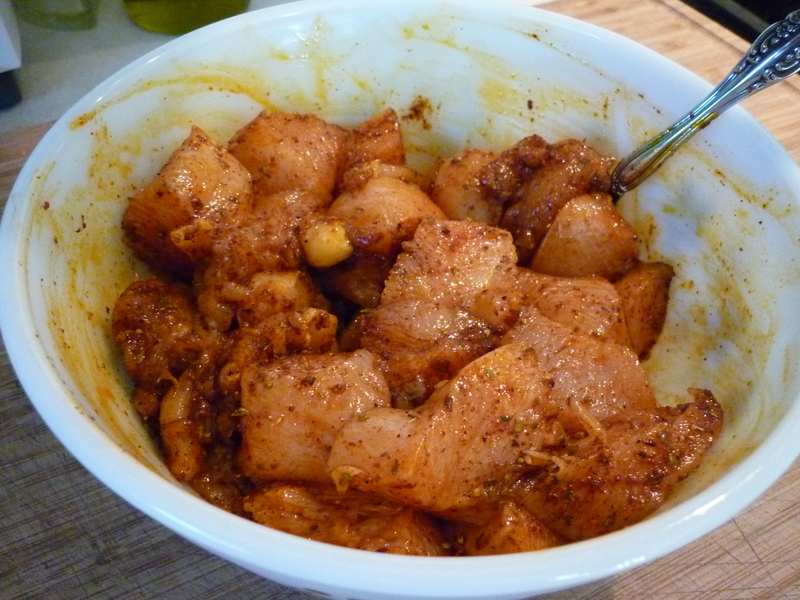 In a medium bowl, mix together 2 tablespoons olive oil, paprika, oregano, and salt and pepper. 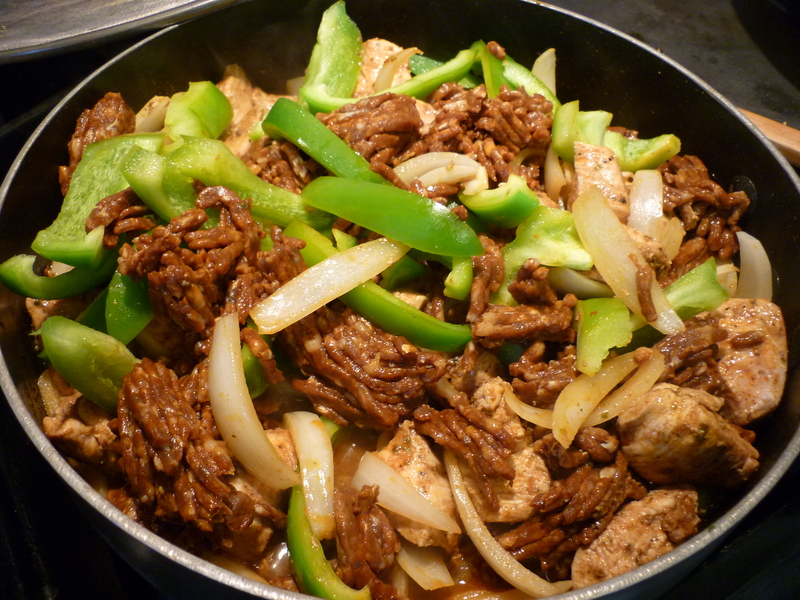 Stir in chicken pieces to coat. Cover, and refrigerate. Heat 2 tablespoons olive oil in a large skillet over medium heat. Stir in garlic, red pepper flakes, and rice. 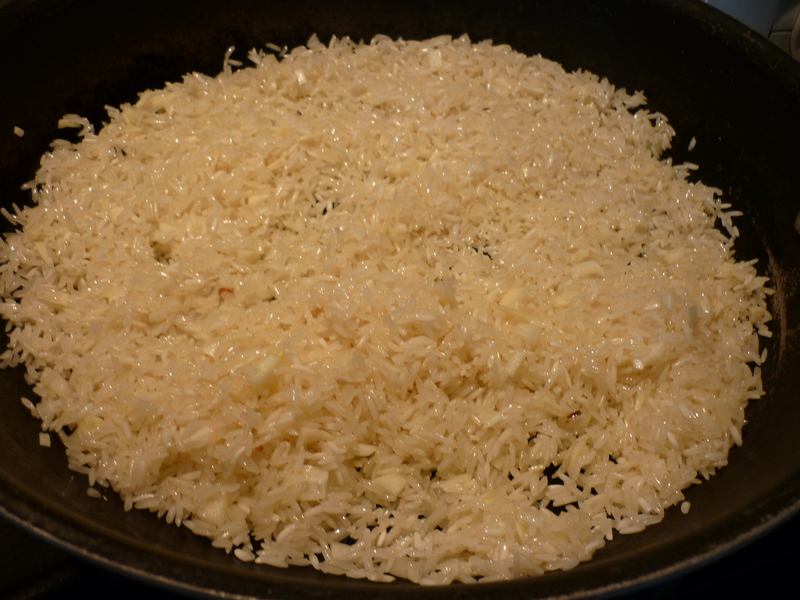 Cook, stirring, to coat rice with oil, about 3 minutes. 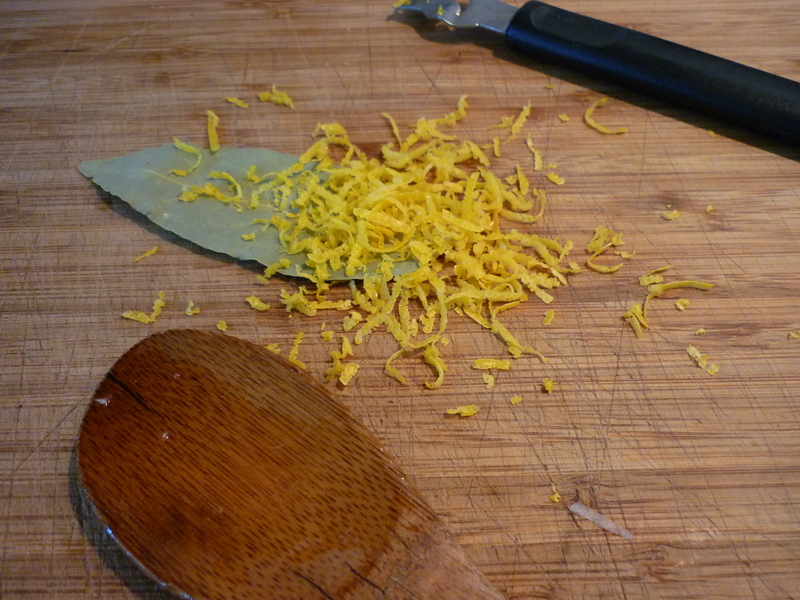 Stir in saffron threads, bay leaf, parsley, chicken stock, and lemon zest. 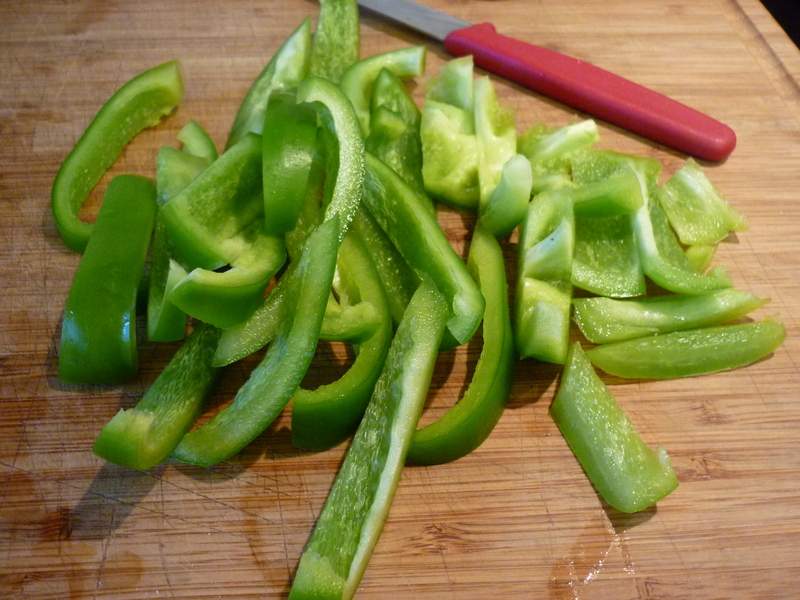 Bring to a boil, cover, and reduce heat to medium low. Simmer 20 minutes. Meanwhile, heat 2 tablespoons olive oil in a separate large skillet over medium heat. Stir in marinated chicken and onion; cook 5 minutes. Stir in bell pepper and sausage; cook 5 minutes. Stir in shrimp; cook, turning the shrimp, until both sides are pink. Spread rice mixture onto a serving tray. 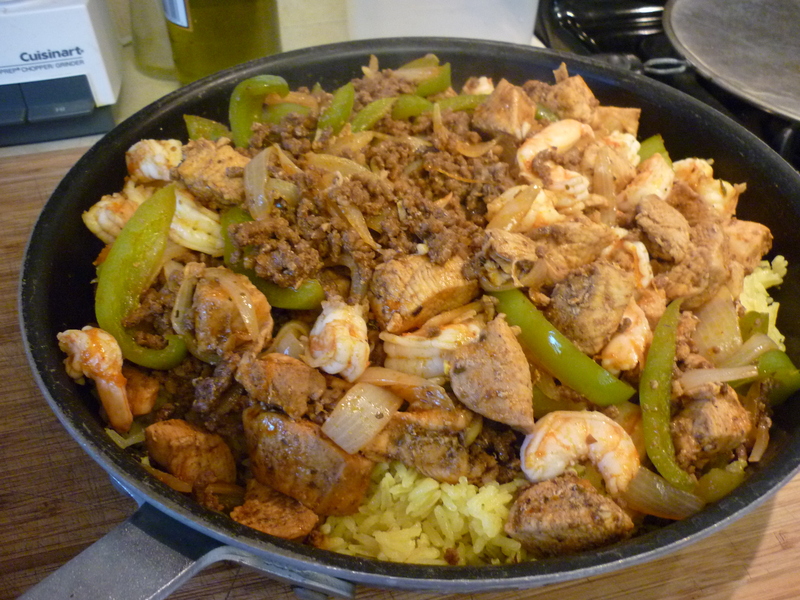 Top with meat and seafood mixture.